Partners from the Factory-in-a-Day project have developed a prototype of a robotic arm that is completely covered with sensors. The idea is that this will make it virtually impossible for the arm to bump into people or objects in a working environment. Visitors to the RoboBusiness Europe 2017 event (from 19 to 21 April in The Hague and Delft) will be greeted in a very special way. They will be welcomed by a robotic arm completely covered with sensors, which amongst other things, can measure the distance between themselves and objects or people. The robotic arm is a result of the EU project Factory-in-a-Day. "The sensors can gauge pressure, distance, acceleration and temperature. Another advantage of this robotic arm is that it is self-calibrating." The safety of people working alongside robots is an important aspect of Factory-in-a-Day. Fitting sensors to a robot to make it “feel” that either people or objects are around it, is potentially a good way of increasing safety. To put this idea to the test, the Technical University of Munich developed a ‘smart skin’ out of different sensors that can instantaneously self-calibrate, which helps the robot to avoid contact/crashing by using intelligent controls. Consortium partners LAAS-CNRS and Siemens PLM provided technology for obstacle avoidance. ‘Delft University of Technology was mainly concerned with the software (open-source) for the UR5 robotic arm, focusing on the integration of all the systems. In principle, the system with sensors can be used in robotic arms for a whole range of applications. "In principle, the system with sensors can be used in robotic arms for a whole range of applications." European small and medium-sized businesses rarely make use of advanced robot technology. 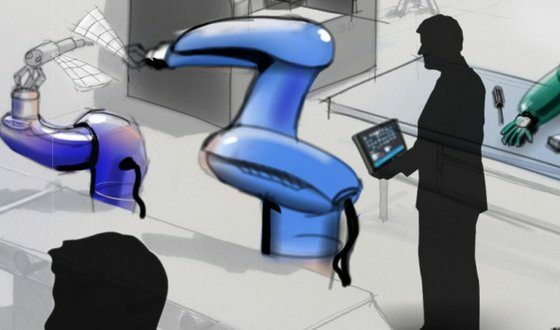 The EU ‘Factory-in-a-Day’ project is an attempt to change this situation by developing a flexible, inexpensive robotic systems that can also be leased. The international consortium consists of sixteen partners with TU Delft as coordinating university. The robotic arm is still at the development stage; the final prototype will be ready to be shown in September, at the end of the project Factory-in-a-Day. The unique robotic arm will be on show at the RoboBusiness Europe event, booth B170, which takes place in The Hague and Delft from 19 to 21 April 2017. The event combines the trade fairs and conferences of RoboBusiness Europe, TUS Expo and ROS Industrial Summit, making it one of the largest robotics events in the world. It is expected to attract over 4,000 visitors from around the globe. The conferences will be held at the World Forum in The Hague and there will be an extensive programme in and around Delft.